So, on Wednesday evening, I finished Resident Evil VII: Biohazard. Or possibly "Resident Evil VII: Biohazard"; I don't know what the preferred style on video game titles is, and I refuse to look it up. Because I don't review them. Because I only very rarely play them. I am a casual gamer. This is my confession. 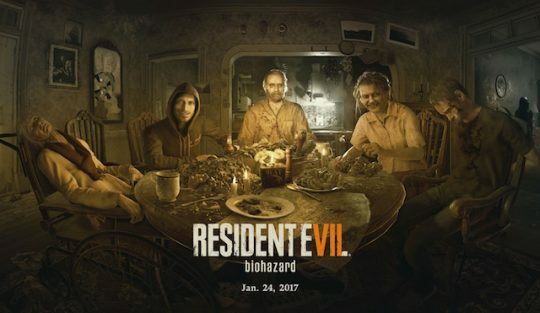 Back to "Resident Evil VII: Biohazard" for a moment: I quite enjoyed it! Perhaps not quite as much as I liked the previous three entries in the genre, which were more like clever action games with a patina of horror. This is more in the horror-survival mode: As Ethan—who is searching for his wife, Mia—you spend much of the early going running from villains and being scared by dark corners and spooky sounds. Mia, you see, has been kidnapped by a band of Louisiana hicks who have been exposed to a pathogen that has mutated them into monstrous, murderous psychopaths. But what caused the mutation? And how can Ethan stop it to save Mia? Anyway, it's pretty entertaining. I was not disappointed that this was the first video game I was able to play in 18 months! That's right, it's been a year and a half. I've never exactly been an avid gamer–the Nintendo Entertainment System in all its 8-bit glory was the height of the console wars, as far as I'm concerned—but I have usually made time for a couple of games a year. I like to keep my toes in as many cultural waters as possible, given my standing as one of the nation's most foremost critics. But, alas, video games eat up an unnatural amount of time, so they have been shunted to the wayside. And, honestly, they feel, well, somewhat dirty. Whenever I would tell the missus that I was headed downstairs to play "Resident Evil VII: Biohazard" it felt as if I was sneaking away to watch Skinemax or some other self-indulgent, worthless endeavor. I can morally and aesthetically justify checking out of family time to read Nabokov's Lectures on Russian Literature, but pretending to be a guy killing zombies for an hour seems quite callow. In large part this is because, frankly, I'm not that good at video games? I know there are some who think that it's far more pathetic to pour hundreds, thousands of hours into video games yearly—but, I'll be honest, I kind of respect that dedication, that effort to make oneself good, better, the best at something. As a casual gamer—as the sort who gets seasick for the first few hours of a first person shooter after a long layoff, the sort who takes 15 hours to finish a 10 hour game, the sort who frequently relies on internet-based walkthroughs to get past very basic challenges—I'm not really excelling at anything. I'm just stumbling along, a n00b like any other. Nobody likes a n00b. More to the point: nobody likes feeling like a n00b. No one likes the self-awareness that comes along with being a n00b. We all want to believe we're great at whatever it is we're doing. Or, at the very least, we want to believe we're competent. The curse of the casual gamer is to know, with very real certainty, that you are bad at the thing you're doing. That you aren't excelling, that any 15-year-old punk with a PS4 and the interest to play the game you're playing would, almost instantly, be better than you. This is the shame I live with. I pray it's a pain you never have to feel.